The Luhr Jensen Hot Shot Side Planner is a Surface Planer for Right or Left Hand Troll. The Hot Shot Side Planer has a Buoyant Body and Adjustable Trip Mechanism. 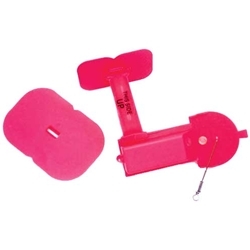 You can position lure any distance from planer and includes a small rudder and large rudder. This planer is Free-Sliding and can be used for trolling or back trolling. It Allows stream anglers to back troll plugs from shore.